When working with the stones for this chakra think red and earth, anything that is grounding is great. When using these stones for healing, these stones are said to be excellent for anemia and other blood deficiencies. Red offers a healing vibration for depression and lethargy, think spark, energy and passion. In nature, red represents heat, fire and anger. Rose-red is the color of universal harmony. Black tourmaline: This is a protective stone when you feel threatened at the survival level. Fearful. Feel survival threatened. Negative. Exceedingly powerful for 1st Chakra work. Hematite: This stone helps you to set protective boundaries when you feel as if others are intruding into your private space. Depression, pain. Keep people out of your space. Black and snowflake obsidian help you to see what material things you no longer need for growth. Extremely Protective. Release from excessive need for possessions. Smoky quartz, the lightest of the dark stones, helps to blend the energies of the first and seventh chakras. Tiger’s eye helps you to feel secure about physical existence. Any of these stones may be placed at the base of the spine or at the feet. Ruby: Protective of all around you, including family, possessions and good name. Red Coral: emotional healing, considered a bolster remedy for physical disorders involving blood and bones, nourishing blood cells and strengthening the skeleton. Red aids in conception, mother-child bonding. It also Brings peace, stimulates intuition, enhances vertility and relieves stress. Red jasper helps to connect us to the flowing energies of the earth. 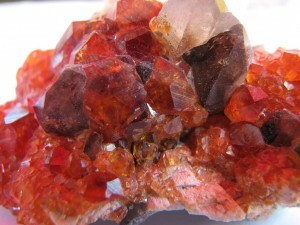 Ruby, the stone of passion, enhances sensory awareness. Ruby in Zoisite is a way to benefit from ruby’s energy in a grounding form. Laying down place the proper gemstone upon the Chakras for 5-25 minutes, best to do while meditating or concentrating on a certain chakra; you can do one or all of them at the same time. So when you have a “ELEMENTS” painting in your home that energy from the stones will resonate in that room. Just like if you were to hold a stone, or wear a stone, the properties generate even in the room. So every “ELEMENTS” series painting will list the stones I used on the painting and I will have the properties on each piece so you know what energy that will resonate from each piece. You can also wear them throughout the day as jewelry. As long they are on you they will be the most effective to you.